In the beginning they were just the extreme right; xenophobes with often racist outbursts. In the beginning of the 21st century they discovered the word “euro-scepticism” and like so many others around Europe they made it the magic carpet that could cover all their dirt. Soon they even changed their name aiming to something more politically correct and acceptable for the Europeans and the outlanders. That made the trick and from floating around 0% in 2011 they got 19.1% becoming the third biggest party in the Finnish parliament. In 2015 they are confident they are going to be part of the new government in Finland. Perussuomalaiset, the name of the party and doesn’t matter how much they want to cover it for the “naïve” and multicultural foreigners, it translates into the undoubtedly discriminative “Pure or True Finns”. It took me long time and a lot of troubles to understand one thing about Finland and Finns, that what really matters is to look legal. Doesn’t matter the ethic; as long in the surface everything looks legal and follows the much praised in Finland rules, then it is acceptable. Obviously it took nearly 40 years the Finnish extreme right nationalists and fascists to understand the same thing. It also took a change of leadership. Of course it hasn’t been easy for them the last ten years and social media have often become their self-distraction arena with racist, xenophobic and prejudice comments from members of the True or Pure Finns party. - I insist calling them with the real translation of their name and not the name they like to forcefully dictate for manipulating reasons. – But that has not managed to remove voters, on the contrary the party has strengthen its numbers. Obviously their legal and political correct cover has worked for a lot of people in Finland who were afraid or embarrassed to show their true believes. This has also changed the political spectrum in Finland. Suddenly nearly all the Finnish political parties, from the social democrats to the Christian democrats started showing signs of xenophobia and discrimination hoping that this will attract prominent True/Pure Finns Party voters. A few years ago the leader of the Christian Democrats, Päivi Räsänen, in an interview has hinted that even though immigrants and refugees are welcome to Finland, Finland would be more suited for Christians than Muslims. Very Christian for her part! That very prejudice remark from the interior minister – and responsible for immigration and refugees in Finland – was straight away covered by the argument that she was protective to Muslims and she didn’t want any harm to them when they immigrate in Finland. And while everybody accepted this explanation nobody wander if the interior minister says something like that, how dangerous is Finland for the Muslims now? Obviously not as dangerous as to be a Greek lately. This is the latest xenophobic rhetoric trend in Finland. 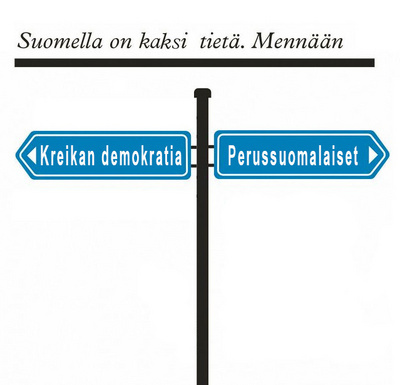 The ruling conservative party, Kokoomus, was the last to join with a full cover page advert in the much popular newspaper, Helsinki Sanomat asking Finns to choose between work and the Greek way hinting that the Greeks are lazy and cheaters. How Finns received this message? In a very …pure Finnish way, incidents of hate attitude and bullying against Greek immigrants in Finland increased dramatically. The Social Democrats (SDP) have their share in this xenophobic game just like the Centre Party, Keskusta, it just happens that both these parties have long experience in governing politics so they know better how to cover themselves and keep away insulting messages from their rhetoric. The Swedish People’s party is as always isolated in its own linguistic loneliness and often victim of bullying from the True/Pure Finns Party. What is left is the Green Party and the Left Alliance. Both parties have seen huge chances after a shift in their leaderships. The Green Party came out of a long period of introversion where personal ambitions were confused with party policies and principals. 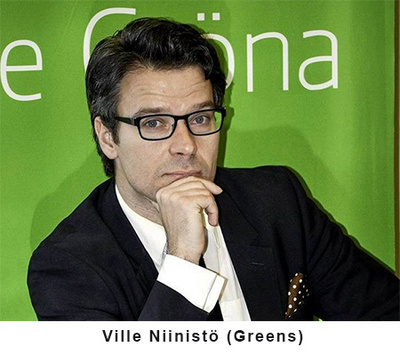 The new leader of the Green Party Ville Niinistö has return the party to its fundamental principles giving a new breathe to the Greens and hopefully increasing their percentages. The Left Alliance seems to be still deep without recover in its introversion period since the 2006 resignation of the charismatic Suvi-Anne Siimes. A latest survey in Finland shows the governing Kokoomus falling around 16.2% which marks the lowest result since 1966, the Social Democrats around 16.8% and Keskusta the obvious winner with 24.9%. The True/Pure Finns follow with 15.4% which is better than their last attempt in the euro-elections but much worse from the 19.1% in 2011. The Greens and Left Alliance seem to get an 8.8% each and the Swedish People’s Party comes with a 4% of the vote and the Christian Democrats just under them. But in the end everything depends on how many voters will actually vote and experience the last few years has shown that these surveys can mislead. 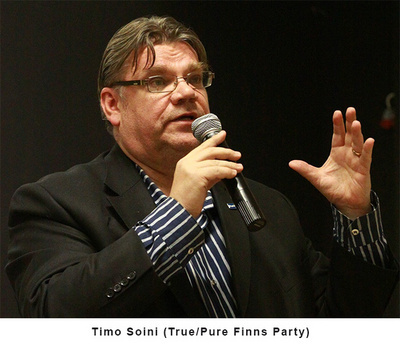 In 2011 despite rumours that the True/Pure Finns were increasing their power nobody believed it for true and the survey were giving them around 12%. I actually had as a guest in my radio program the secretary of the Socialist Democratic Party a week before election Sunday and he declared confidently that the True/Pure Finns will never go above 6%. Next Sunday’s 19.1% was a shock for everybody. Still the big question is who’s going to participate in the next coalition government. The True/Pure Finns have established their “legality” and there are already members of the Keskusta who openly talk about a partnership with the True/Pure Finns. 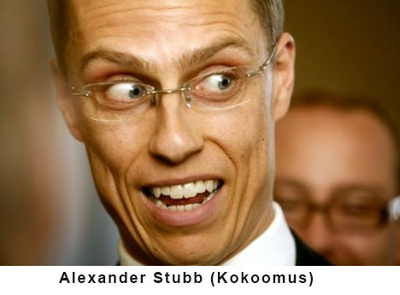 The other possibilities are with the SDP or the conservative Kokoomus, but with Stubb leading Kokoomus that looks very difficult and with the SDP despite the superficial calm, old passions since Lipponen era are still alive. But it is not only governing, it is a whole society that has changed the last decade. Just think of it, one fifth of the Finns around you are hostile to foreigners. They think of them as parasites who came to Finland to enjoy a welfare state paid by their taxes. And you know it’s not entirely their fault. Päivi Räsänen and Timo Soini to start with have often told them. And yes the prime minister and the president have often said that the immigrants in Finland are great help especially to the pension system but they said it in a way like they had to say it because some kind of power forced them to say it or trying to be European style politically correct and not because they wanted to. Finland is one of the countries that has nearly perfect laws to protect human rights but what we always forget is that it is humans that apply and enforce these laws and this is where the system even in Finland fails. Especially since a fifth of the population has consciously voted for a xenophobic, racist, prejudice party with or without their euro-sceptic veil. Even if some of these votes absorbed by the Centre Party (Keskusta) or the Conservative Party (Kokoomus) the ideals and the prejudice remain in the people. These are very critical elections for Finland, not because of the result per se but because they will mark a fundamental change into Finnish psychic or the way they like to project themselves. The 14 years I lived in Finland I witnessed the change; from the down to earth, hardworking and modest people to arrogant, xenophobic and prejudice. From a nation with respect to a nation that bullies. And I saw it in all the levels of the society. I also saw the rebirth of finlandization with only difference that they have replaced Russia with Germany and I actually saw the consequences the rise of the The True/Pure Finns has brought in both, the state and the people. And the result was not nice at all. In a world that constantly changes, you cannot talk about ethnic purity while suppress the Lapi people for example; in a world of democracy you cannot discriminate violently – with the major political parties participating - Greeks, Somalis or Afghan immigrants, in a global society you can say that the state funds and supports only art that promotes the Finnish ideals and the Finnish nation. Then the only one who smiles is Hitler from his grave and the True/Pure Finns are the real winners. That’s what Finns have to decide on the 20th of April doesn’t matter who will win on the 19th. 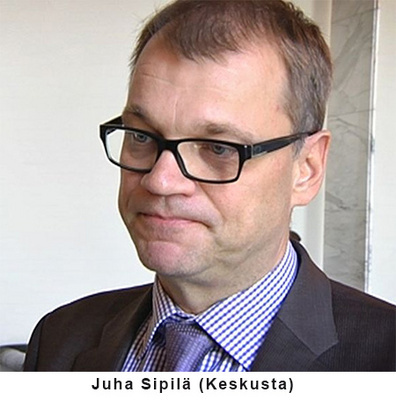 And if Juha Sipilä, the chairman of the leading the surveys Keskusta, becomes the next Finnish Prime minister he has to decide where he leads the country and in his case will not be the Greek road or work but democracy with whatever that means or the True/Pure Finns way. Indeed, Thanos, what you describe seems to be a microcosm of the larger macrocosm which is the EU and the US: all the laws against discrimination and violation of human rights are there, on paper. They look good on paper but that will not solve the problem of xenophobia which seems to be rampant. Looking good on paper simply will not do. As William James used to quip: if you wish to know what people really believe, do not read what they put on paper, look at how they behave.